My second Raspberry Pi came at the end of last week, so now I have one to tinker with in addition to the first that I’m using as a media player. It turns out that it’s not just SD cards that the raspi is fussy about, I had a real struggle getting either of my spare monitors to work with it. In the end I somehow found the combination of HDMI-DVI adaptor and cable that had worked last week and things sprung to life. Getting a monitor to work wouldn’t be necessary if SSH was enabled by default, which sadly it isn’t. Once SSH is sorted out you can use your favourite client (mine is PuTTY) to connect to the raspi. I also configured key based login, but that’s a different howto. The purist in me was going to just use an X server (probably Cygwin) to connect to the raspi, but VNC is easier to get going. I’ve set the resolution here to be the same as the iPad. At this stage it might make sense to test things with a VNC client from a Windows (or Mac or Linux) box. I used the client from TightVNC . There are probably a bunch of VNC clients for the iPad, but I regularly use iSSH for a variety of things, and although at £6.99 it’s one of the most expensive apps I have on my iPad I generally think it’s worth it. At this point things are probably easier if you have a bluetooth keyboard (and mouse). With two protocols (SSH and VNC) configured it’s possible to do useful stuff with the Raspberry Pi remotely, and the iPad with iSSH makes a fine piece of glass to use it through. 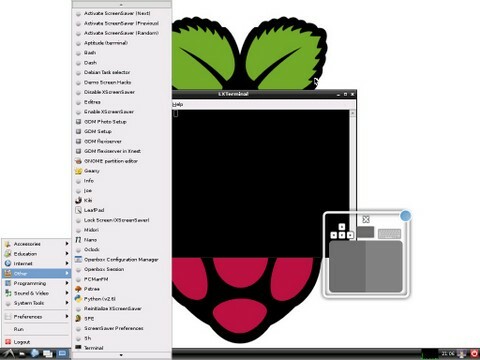 With thanks to the My Raspberry Pi Experience blog for the VNC howto I adapted here. If you want more of a detailed walk through with loads of screen shots then take a look there. I ordered from both suppliers in the first couple of days as it was utterly unclear which was going to get their act together. If you do use PuTTY then it may make more sense to generate keys using PuTTYgen rather than ssh-keygen (another howto). I think the key thing would be to support SSH, there’s nothing that special about VNC on the RPi. Thanks, just what i was looking for! nice to see its working. Something like that should be possible if you add a bluetooth adaptor to the RPi (or bit bashed it via USB to the 30pin dock on the iPad), but I seriously doubt that it would be worth the effort. I’ve carried out your steps above but the connection is refused when I try to connect. It’s fine via ssh so I know the connection is ok so it must be related to vnc. iSSH doesn’t need a session number. Are you trying to connect to VNC directly or via an SSH tunnel (and have you tested the VNC connection using a different client such as a PC or Mac)? Thanks for the reply. I have multiple sessions so needed to distinguish between them. Hopefully this will be of help to someone else.